This is a simple tool, that can distribute the cost of making the wine, and any other costs you need or want to "absorb" into the bottled wine itself. As it is unlikely you want to evenly distribute the costs of making the wine to all your products; this tool allows you to "weight" the wine according to reasonable (to the tax office) criteria. These criteria might be the selling price of the wine, or calculated costs of making each wine, or some other metric. A very simple example might be this. You are a small winery that had $200,000 of costs you need to "Absorb" into your bottled wine. You made 10,000 bottles of Cabernet Sauvignon, and 20,000 bottles of Sem Sauv Blanc. You decided you were going to "weight" the cost of wine proportional to the RRP, which in your case is $25 and $15. The costs of each wine, is given by the calculator as $9.09 and $5.445 respectively. If all this seems complicated, more can be found on the tutorial page. In general we suggest most wineries will want their accountants to do this, though smaller wineries without good access to their accountants for these sorts of operational matters might have a go at doing it. 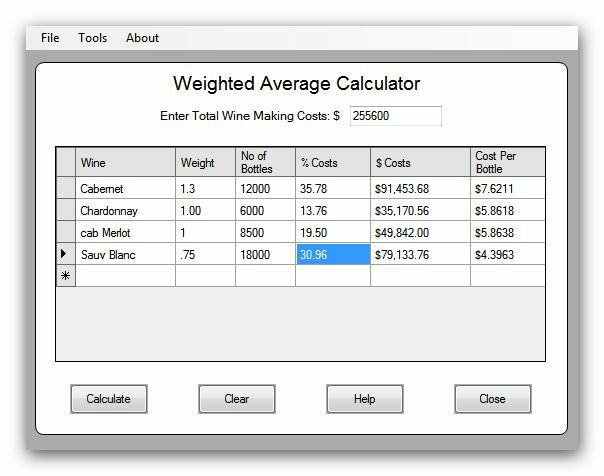 Hopefully we can find time to make this calculator more useful, by allowing it to remember previous calculations, though as most wineries have few products, and those products are different each year (different vintages), then it was not considered necessary at the time of build. It can be used by anyone wanting a simple weighted average calculator. You can download the Weighted Average Calculator here. This tool is free, and can be used, distributed and abused in any way you see fit. You must however make sure you understand the figures the calculator tells you - we can't take responsibility for any decisions you may take by using this tool. This tool will install on Windows, with XP SP2 or later. It might need other files, and will download them automatically from the internet if your computer is missing them. The screenshot shows a calculated example. Only the first three columns are filled in by the user, the other columns are calculated.